The table is set for Missouri’s vote on constitutional Amendment 7 on August 5th. After two years of machinations in Missouri’s state legislature, the sales tax increase to boost MoDOT’s budget passed near the end of the 2014 legislative session, trimmed from a 1% hike to .75% before getting a final vote. Missouri governor Jay Nixon in late May set the election date for the August 5th primary, leaving a mere 6 weeks for MoDOT and regional planning agencies around the state to program $6 billion in new spending over a decade. MoDOT has been in search of an additional revenue stream, as the flat gas tax has been untouched by the legislature since 1996 and has fallen to the seventh lowest in the nation. Meanwhile, money borrowed by MoDOT between 2001 and 2010 to fund an accelerated construction program is running out, while federal stimulus funding from the recession simultaneously expires. The net effect is MoDOT will have a reduced construction program after a decade of their most robust construction and expansion budget in recent history. While Gov. Nixon has made few public statements about the August 5th election date, its generally accepted that primary elections in Missouri trend more republican than general elections, hence the chances of passing a large tax increase are slimmer. Nixon opposes Amendment 7 since it would boost highway spending at a time when the republican led Missouri legislature passed a phased income tax cut, which will limit spending on other state responsibilities like education for a decade or more. Planning agencies around the state responded to the accelerated election date in different ways. In the St. Louis region, East-West Gateway (our Metropolitan Planning Organization (MPO)) cancelled its stakeholder process (a committee I participated on) and gave the project selection responsibility individually to the five Missouri counties in their planning area. MoDOT worked separately with the Mayor’s office in the City of St. Louis and with the County Executive and St. Louis County Highway Department. Despite the fact that St. Louis City and St. Louis County largely share one transportation network and Metro covers both areas equally, project decisions were made independently. The project lists generated by local counties and approved by MoDOT’s commissioners on July 9th are below (see link). The City’s list is a mix of complete streets projects, greenways, and seed funding for a streetcar (which Metro has not endorsed) and two Bus Rapid Transit (BRT) routes (which Metro has). Despite being the transportation hub for the entire region, the city’s funding allocation from MoDOT was based only on population – meaning the City is likely under-funded in regards to the size and importance of its actual infrastructure to regional transportation. St. Louis County received both the region and state’s largest funding allocation, with over $800 million in new spending available. The County was one of the few jurisdictions in the state with enough funding to make a substantial impact on transit service. Their project list shows they decided to go in a different direction, allocating a mere 2% to transit projects. Without the County leading the way on transit, and without City/County cooperation, the City was forced to play small-ball on its transit desires. With that message in mind, any analysis of the St. Louis region’s project list can come to only one conclusion: In our region, its still all about highways. Regionally only 5.5% of funding would go to transit projects, and a substantial amount of that (The central corridor streetcar, for instance) will require another local tax increase before MoDOT releases funding. The region’s highway system, already one of the most robust per capita in the country, would see expansions almost across the board outside of I-270. Nearly $200 million in new spending would be allocated to add new lanes to I-55, Highway 94, I-64, and I-44. Placing these highway expansions in context is important. The core of the St. Louis region, St. Louis City, County, and St. Charles County, have seen only a 1% increase in population since 1970. Over the same period, the United States population grew by 34% while Missouri grew by 22%. The St. Louis region has low traffic congestion. Moreover, the region has seen annual declines in total miles driven since 2007 and is about the same as 1999. Despite all indications that the region already has an overbuilt regional highway system, passage of Amendment 7 would expand it further. Along with lane additions, St. Louis County placed an equal level of importance on complete rebuilds of portions of the interstate system. MoDOT’s phrase, “Improve I-270” belies a $350 million expenditure with little detail attached to it. Similarly $200 million would be spent to “Improve I-70” between Natural Bridge and Hanley Road. These highway rebuilding projects and lane additions account for the lion’s share of the county’s funding allocation. The round numbers attached to these projects, $200 million and $350 million, reveal that they’ve yet to have environmental or engineering studies completed, meaning the figures are simply best guesses as to what the projects might really cost. Leading into the effort to pass the tax increase, MoDOT lead a state-wide “listening tour” they dubbed, “Missouri on the Move”. To their credit, they surveyed thousands of Missouri residents and published the results of their work in February of this year. 62% of St. Louis area residents who responded to the MoDOT survey prioritized expanding public transit, while only 40% prioritized expanding the region’s road network. When MoDOT released the region’s project list in July, it revealed a different set of priorities for regional elected leaders. The vast majority of funding would go to rebuilding and expanding highways, with only about 3% of the region’s allocation guaranteed to be spent on transit. Absent, and off the table for at least another decade, is a substantial transit project like a North/South MetroLink expansion. Following the political efforts to pass the transportation tax increase closely over the last two years, one thing becomes striking: How little conversation there is about transportation. We have the facts. MoDOT’s own data shows a robust highway system in good repair with record low levels of congestion. Driving is declining, while Missouri’s aging population and sluggish population growth is likely to extend that trend. The conversation has been reduced to this: “All transportation spending is good transportation spending.” No analysis has been done on how adding lanes to existing highways will increase MoDOT’s future maintenance costs, perhaps requiring future asks for additional tax increases. Virtually absent has been a conversation on how transportation spending affects land use. Transportation spending in the St. Louis region over the past 5 decades has primarily accelerated the depopulation of the urban core and portions of St. Louis County. In the last two decades the population of many American cities rebounded after 30 years of declines. Not so in St. Louis, where the decline merely slowed. Without oversimplifying the issue, the correlation between a rapidly expanding highway system and consistently declining population and real estate values in the urban core could not be more clear. Transportation infrastructure can move people away as easily as it can draw them in. Context matters. In a region desperate for new population, a highway expansion boom is likely to undermine already struggling areas. Smart transportation spending requires planning that can’t be done in 6 weeks. 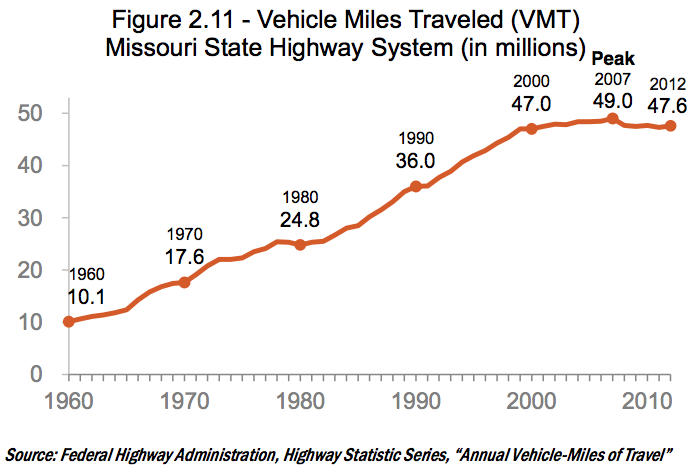 Missouri’s road network is already in comparatively good shape. The state has plenty of time to develop a more equitable, intelligent, strategic plan for transportation spending. The false sense of urgency cultivated by MoDOT is leading the state head-first into a decade of spending aligned neither with resident preferences nor the transportation needs of the future.